Note Before you begin troubleshooting any of the following issues, you'll want to first verify that you have the latest version of the Xbox app on Windows 10. Users in the European Union and Korea using a Windows 10 N or a Windows 10 KN will also need to install the Media Feature Pack for N and KN versions of Windows 10 to use this feature. Make sure to turn on your Xbox One and connect it to the same subnet as your Windows 10 PC. If it’s turned on and connected to the same network, you may need to specify the IP address of the Xbox One. You can find the Xbox One’s IP address by pressing the Xbox button to open the guide, going to System > Settings > Network > Network settings, and then selecting Advanced settings. Open the Xbox app on your PC. 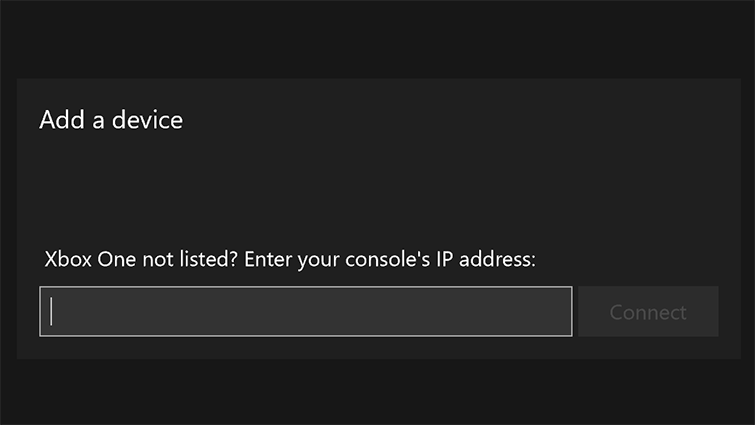 In the navigation pane, select Connection, enter the Xbox One IP address into the Xbox One not listed? Enter your console’s IP address box, and then select Connect. If this doesn’t work, your Xbox One probably isn't on the same subnetwork as your Windows 10 PC. Check that both are on the same network. Important Make sure you don’t share the same SSID (network name) for both your 2.4 GHz network and your 5 GHz network. Some wireless routers will default to using a single name (SSID) for both the 2.4 GHz and 5 GHz networks, while others will default to two separate names that help you identify the frequency band. If your router uses the same network name for both networks, you can configure the router to assign different names to each network. By creating separate names for each, you can explicitly configure the PC and the Xbox One to use a specific network and frequency band. Finally, try restarting your PC and your Xbox One console, as this can sometimes fix connectivity issues. Check that your Xbox One console allows Xbox app connections. 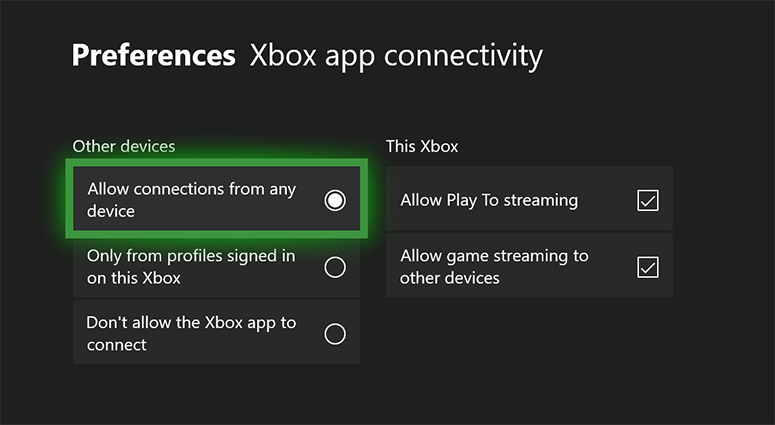 You’ll find this on the console by pressing the Xbox button to open the guide, going to System > Settings, selecting Preferences > Xbox app connectivity, and then selecting Allow connections from any device. If you still can’t connect, try restarting your Windows 10 PC and your Xbox One console. Check that your Xbox One console allows game streaming. 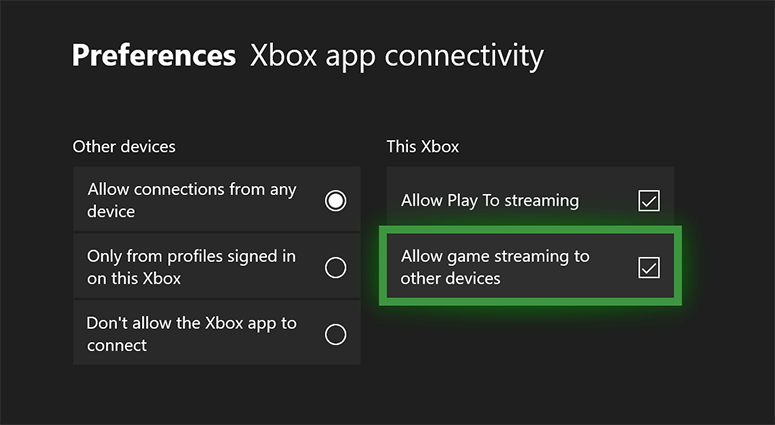 You’ll find this on the console by pressing the Xbox button to open the guide, going to System > Settings, selecting Preferences > Xbox app connectivity, and then selecting Allow game streaming to other devices. If you're having trouble signing in, see Fix problems signing in to the Xbox app. If possible, connect both your Xbox One console and your PC over a wired Ethernet connection. If a wired connection isn’t possible, try lowering the quality level. For information on how to change your quality, see How to use game streaming in the Xbox app on Windows 10. To try to improve your game streaming experience, see Improve Xbox app for Windows 10 game streaming performance. 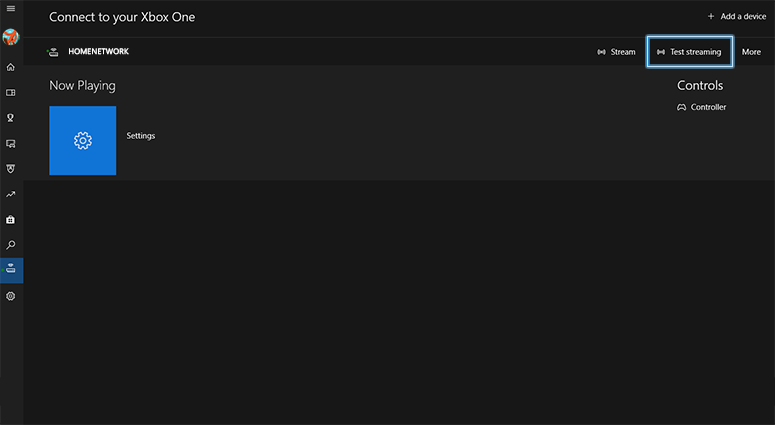 Select Connection, select your Xbox One console, and then select Test streaming. The Xbox app will test the streaming connection and report its results. Some content, such as protected video or protected HDMI video, can’t be streamed to your PC. However, you can watch this content on your console. Unfortunately, you can’t stream a game that requires Kinect, even if you have the Kinect for Windows PC. You can still play those games on your console. At this time, we do not support any controllers other than official Xbox One and Xbox 360 controllers. 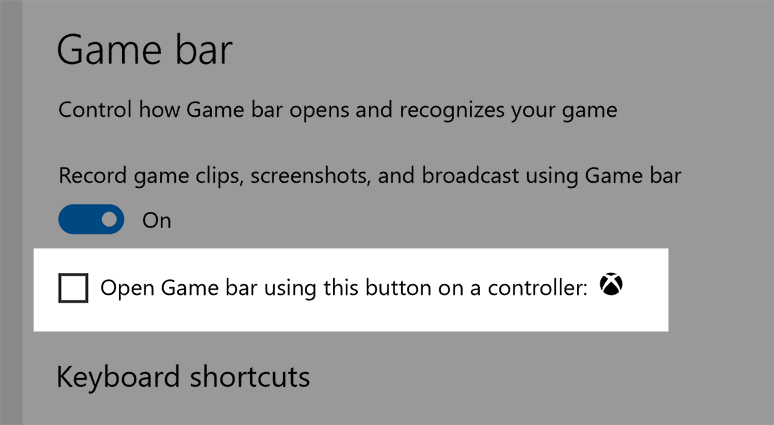 You can stop Game bar from opening when the Xbox button is pressed in Windows Settings. Press the Start button, select Settings > Gaming > Game bar, and then clear the Open Game bar using this button on a controller: checkbox. We do not support using the console to broadcast to Twitch or record Game DVR at the same time as game streaming. Try stopping game streaming, and then disconnecting and reconnecting the controller. If this still doesn’t work, look at your Device Manager to make sure Windows is recognizing that your controller is plugged in. Some games do not handle transitioning the controller between the Windows 10 PC and the Xbox One console. If that’s the case, try restarting the game to fix this issue. Make sure your audio device for both input (microphone) and output (speakers) is set correctly on your PC. Under Control Panel, select Sound. You’ll find these settings on both the Playback and Recording tabs. If you have trouble hearing audio or seeing video, see Troubleshoot game audio or video issues on Windows 10. Computer screens and TVs can display video at different brightness levels. Often games offer a “Brightness” or “Gamma” setting that you can use to adjust the brightness of the game. Your PC’s monitor may require a different setting than your TV. If you have a poor network connection or an older wireless network card driver, it can initiate scans of wireless networks in the background. Some, but not all, wireless cards can be asked not to scan as frequently. Right-click on the Start icon. Right-click on Intel <name of wireless card>. Select Properties from the menu. Select Roaming Aggressiveness from the Properties list. Change value to 1. Lowest from the dropdown list. This will put the Intel driver in the lowest scanning mode. This will increase the roaming interval for the Wi-Fi driver to 120 seconds. Would you like to contact Support regarding the "Troubleshooting Xbox app game streaming on Windows 10" issue you were reading about or a different issue?